It's a story so crazy it has to be true: when the American Embassy in Tehran was overtaken in 1979, six Americans managed to escape. They holed up in the Canadian ambassador's house, while the Canadian government and the CIA thought about how best to get them out. Enter Tony Mendez, a CIA op who's specialty is extracting people. Tony has a crazy idea, the "best bad idea" of the whole bunch: why not fake a Canadian film crew, scouting locations for a STAR WARS rip-off? Ben Affleck has so far limited his directing career to intimate projects: GONE BABY GONE and THE TOWN, crime thrillers set in his hometown of Boston. What made both films so brilliant was how personal they were to the writer/director. Surprisingly, Affleck manages to bring this personal touch to ARGO: it's still an intimate film, centered around the people who made this grand scheme happen. And what a cast of characters we have: Affleck's Mendez, a solid performance, if not quite enough to anchor the film. (As evidenced by the film's second act, where the weight of the film is thrust onto Affleck's shoulders, and the movie flounders for a moment.) The supporting cast far outshines the star: Alan Arkin as a film producer willing to back the whole thing; John Goodman as a makeup artist with CIA ties; and especially Bryan Cranston, chewing his way through his role as Mendez's superior. There's also a whole host of cameos, in the great Hollywood tradition: Michael Parks, Bob Gunton, Richard Kind, Adrienne Barbeau, and others make blink-and-you'll-miss-it appearances. 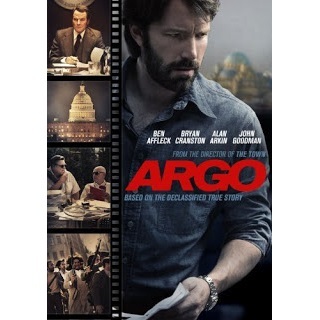 Based on real events, the dramatic thriller "Argo" chronicles the life-or-death covert operation to rescue six Americans, whichunfolded behind the scenes of the Iran hostage crisis.